Andrea Montermini clinched pole position for Race One in the #4 GPC Sport Ferrari 430 but his time of 1.36.668 was just 4 thousandths faster than the Bengala Mosler of Aicart. Row two was also a Ferrari-Mosler mix with the Edil Cris 430 of Ruberti edging out the Motor Competición MT900 of Gutiérrez. The first 8 cars were timed within a single second. Belicchi wons the family contest among the Racing Box Vipers whilst pole in GTB was claimed by Spanish ever-green legend Kuru Villacieros in the González Camino 430. 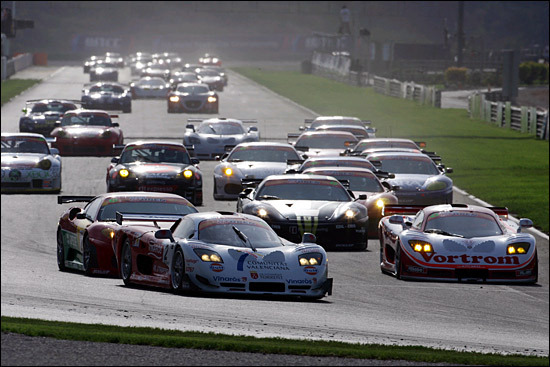 Forty-eight cars took part in the session, with only the Cetea Ferrari 360 Ch. (Lloveras-Izquierdo) left in the pits and unable to take part. There were two “no-shows” among the 51 entrants: Sadly one of those was the #3 Drivex Porsche GT3 RS which Warren Hughes was due to drive whilst the Noel del Bello #18 Porsche GT3 also failed to appear. In addition to the imposed minimum time for the driver change (60”), the following success handicaps apply, these times are added on to their pitstop. 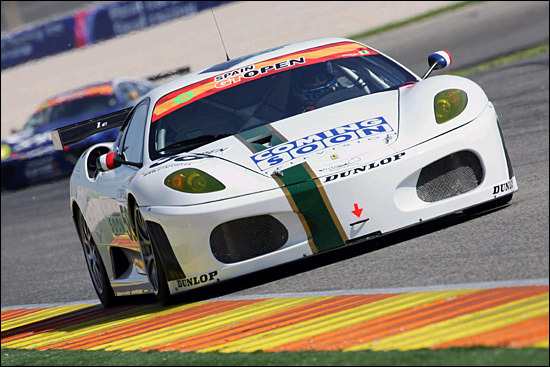 Italian GT Championship regulars Victory Engineering won on their debut in the International GT Open with the Ferrari 430 of Maurizio Mediani and Damien Pasini. Finishing second was the championship leading Escudería Bengala Mosler of Lucas Guerrero and José Manuel Pérez-Aicart, the pair thus reinforcing their grip on the title race. The Porsche 996 Cup of Santiago García and Antonio Castro won a closely-fought GTB race. Despite the crowded grid (47 cars), the start and the first lap were fairly uneventful, Aicart taking the lead in the Bengala Mosler, in front of the GPC Ferrari of poleman Montermini, then the MC Mosler of Gutiérrez and the other 430s of Ruberti (Edil Cris), Sala (AC Andorra), Vilander (Playteam) and the Playteam 360 of Maceratesi. The leading Mosler pulled out a lead which eventually totaled 3 seconds but was then progressively reeled in as the pitstop approached on Lap 12. In the meantime Ruberti had be3en passed by both Sala and Vilander. The luckless Sundberg (RSV Ferrari) was forced to stop in the pits in lap 7 with a transmission problem and Bravo in the ASM Portugal Ferrari spun in the gravel, followed one lap later by Jourdain in the Estudio 2000 Porsche. In the warm afternoon tyres are starting to suffer, and neither Monti (Mastercar 360) nor Vivancos (Sun Red Seat Cupra) could avoid spinning. (Gianmaria on the Edil Cris 360). Maurizio Mediani then showed his form in the 430 of Victory Engineering. He passeed both Cerqueda and Villalba later, reducing the gap to the leader from 12 seconds to nothing and passied Lambertini on the penultimate lap. Poor Lambertini then spun in the closing moments whilst trying to regain the place. Guerrero ends second after an impressive final charge ahead of the other Mosler, Bartyan, amaral, Gião, Cerqueda, Tedoldi and Ganmaria. The GTB class saw a very close and interesting. After the initial supremacy of the Camino Ferrari of Villacieros, after the pit stop, it was the Sande e Castro Porsche of Cruz which took the lead but Santiago García in the Porsche he shares with Antonio Castro managed to claim victory in the final laps. Damien Pasini (1°): “I drove the first part of the race and the main problem was to be able to see something, because the car in front of me was losing oil and the windscreen was completely dirty. Nevertheless, I could follow those in front of me and was able to keep a good pace. We had planned to do the stop quite early and this proved to be the right decision in order to avoid traffic”. 66 GTC Nas/Gil Porsche GT3 17 laps D.N.F. 11 GTA Vivancos/Vinyes Seat Cupra GT 12 laps D.N.F. 30 GTA Bravo/Santo Ferrari 430 GT2 7 laps D.N.F. 31 GTB Medard/Pla Porsche 996 GT3 Cup 6 laps D.N.F. 8 GTA Jourdain/Merino Porsche GT3 RSR 6 laps D.N.F. 5 GTA Romero/Sundberg Ferrari 430 GT2 5 laps D.N.F.